Discovering tweezer-magic in my late teens, I've ended up with overplucked eyebrows as an adult. Worse, they are asymmetric and flat, and try as I may, I cannot achieve an arched brow. Plus, I have sparse lashes. So I'm huge on filling my brows to frame my face - but without making them look weird and unnatural. The Sigma Brow Expert Kit contains seven products to help achieve the perfect eyebrows. I have a demo for you further below. 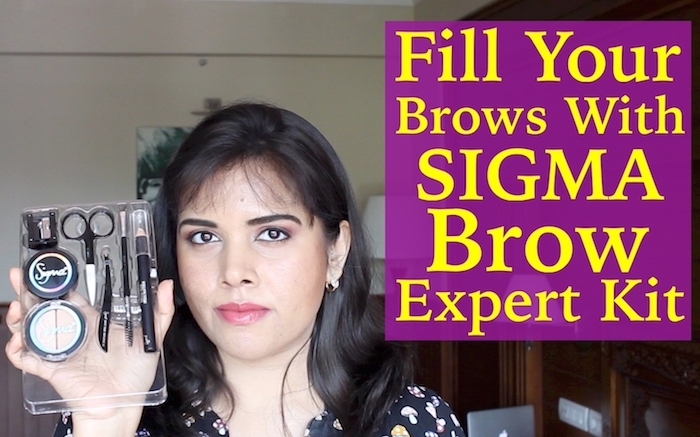 Scroll down to know how to achieve the perfect eyebrows with the Sigma Brow Expert Kit. Here's the tutorial - please give me a thumbs-up, and do subscribe to my channel, if you haven't done so already. You can see above that the products have made a huge difference to my brows, without making them look like I've run them over with a sharpie. This kit contains all you need for perfect eyebrows, from tools to colour products. Plus, it is easy to use. The products are all of very good quality - like Sigma's makeup brushes. It would also make a great stocking-stuffer for someone who likes to keep their brow game strong. The Sigma Brow Expert Kit costs $34 - it was $49 - from here; they ship worldwide.